Once you have enabled all of the required features, you can choose which additional options you want to enable or configure in JungleDocs. In this tutorial you will learn what the included options for configuring JungleBell settings are and how to activate them. All of these can be managed (globally) in Central Administration Settings. You will find the Global Settings for JungleMail in your Central Administration. JungleBell has a few settings that can only be managed in central administration if you choose to do so. For all these you will need to access the JungleBell Global settings. 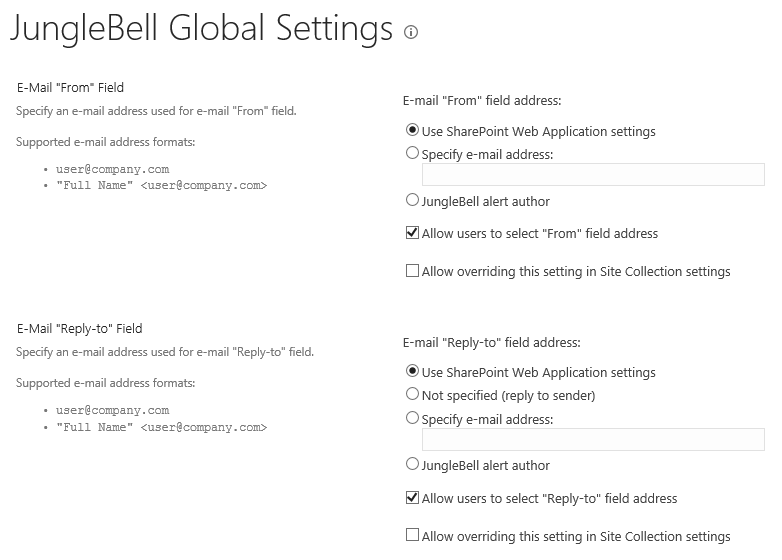 To do this open your SharePoint Central Administration and click JungleBell Global Setting. Let's have a closer look at each one them. You can set a custom From and Reply-to address. Here you can configure if JungleBell users can change these addresses. You can also choose if these settings can be overridden at Site Collection level.